All lined up like little green soldiers on the plate, but not for long. The fried capers give this dish a slightly salty, pungent kick that makes it interesting and according to Chef Gold, "startling". 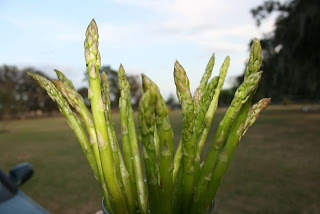 Remove woody bottoms of asparagus. Drizzle 2 tablespoons olive oil on rimmed baking sheet. 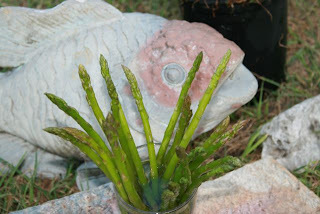 Place asparagus on sheet and roll in oil. Sprinkle lightly with salt. Roast 8 min., shaking pan several times. Transfer to warm platter. Meanwhile, heat the remaining 2 T oil in small skillet. Fry capers over high heat for 1 minute. 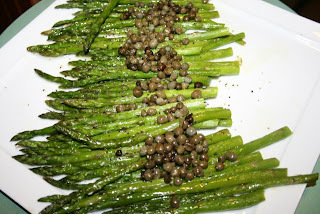 Top asparagus with capers, pass the peppermill at the table. May be served hot, room temp, or cold. To make this side dish a complete meal, top with a fried or poached egg and Canadian Bacon on the side.